Cinco de Mayo Run and Trader Joe’s Finds. Happy Cinco de Mayo! 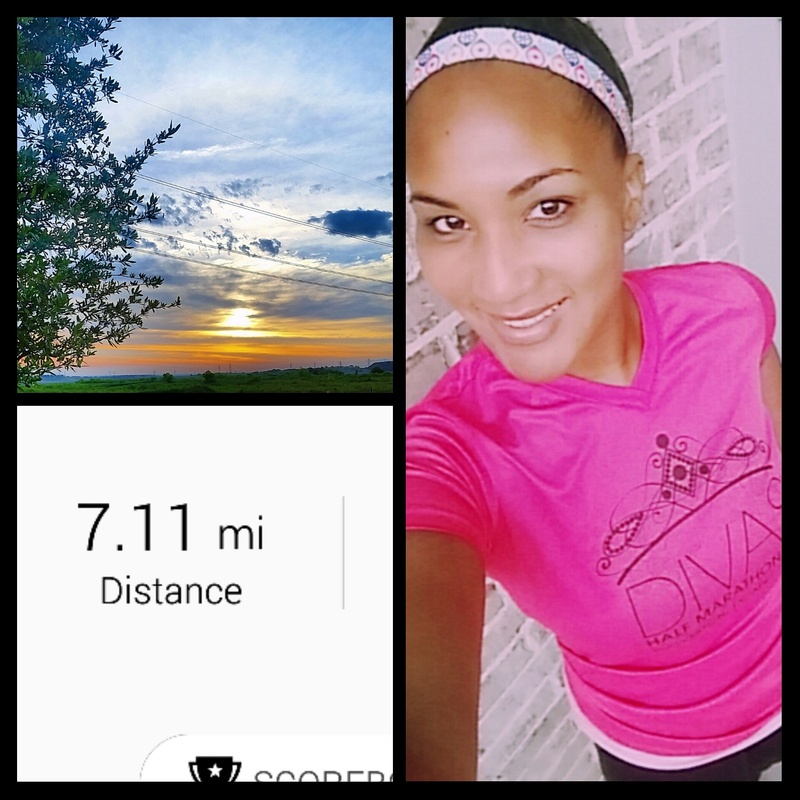 I enjoyed a runrise this morning to the tune of 7 miles. Temps were not too bad…60 something degrees with a nice breeze going. 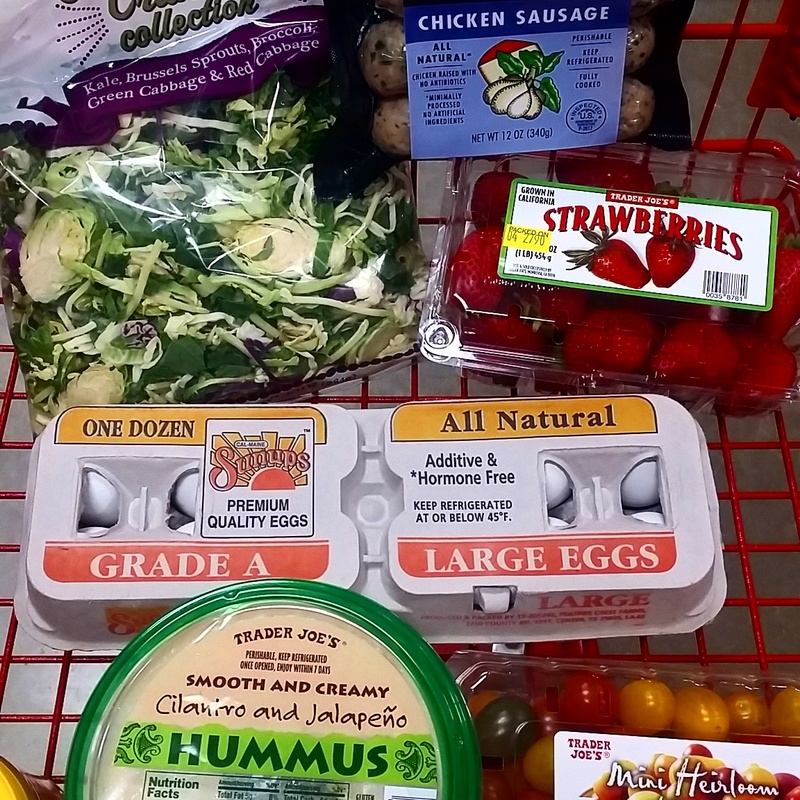 I’ve got some fun Trader Joe’s finds on this lovely Tuesday! I don’t get to go to TJ’s very often (it’s about a 20 minute drive from my house, but a little closer to work) so when I do, it’s like going to Disney World! Haha. Here’s what I bought on my most recent trip. -Cilantro Jalapeño Hummus. Man oh man, this is some good stuff. Zesty and just the perfect amount of spice! Plus, cilantro anything just makes my heart happy. 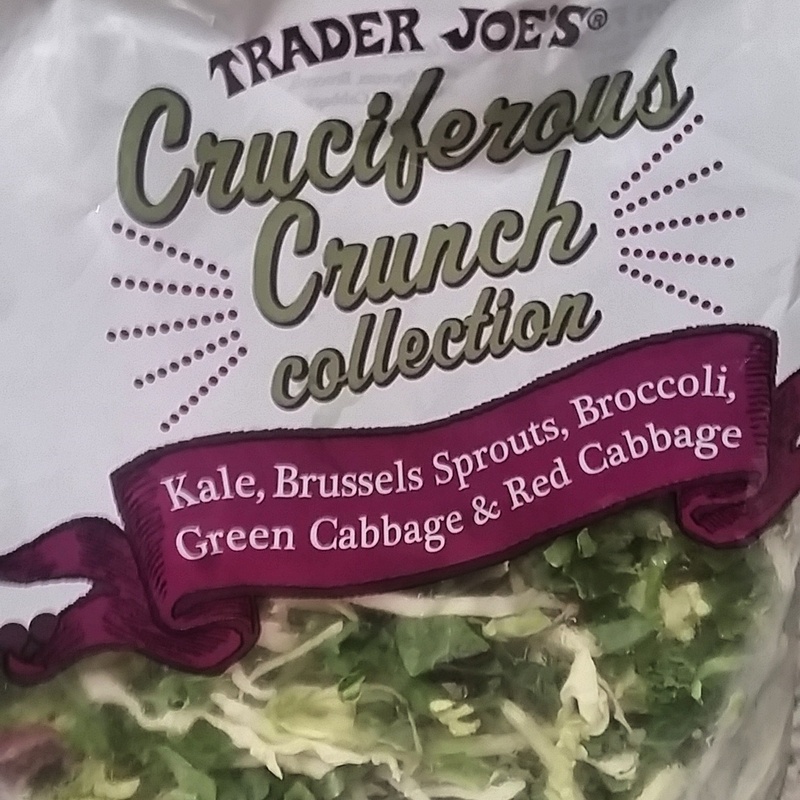 -Cruciferous Crunch. Kale, brussels sprouts, and broccoli mix, oh my! Good stuff mixed with a little olive oil, lemon, and feta. -Heirloom Tomatoes. These babies are super good for a quick snack! 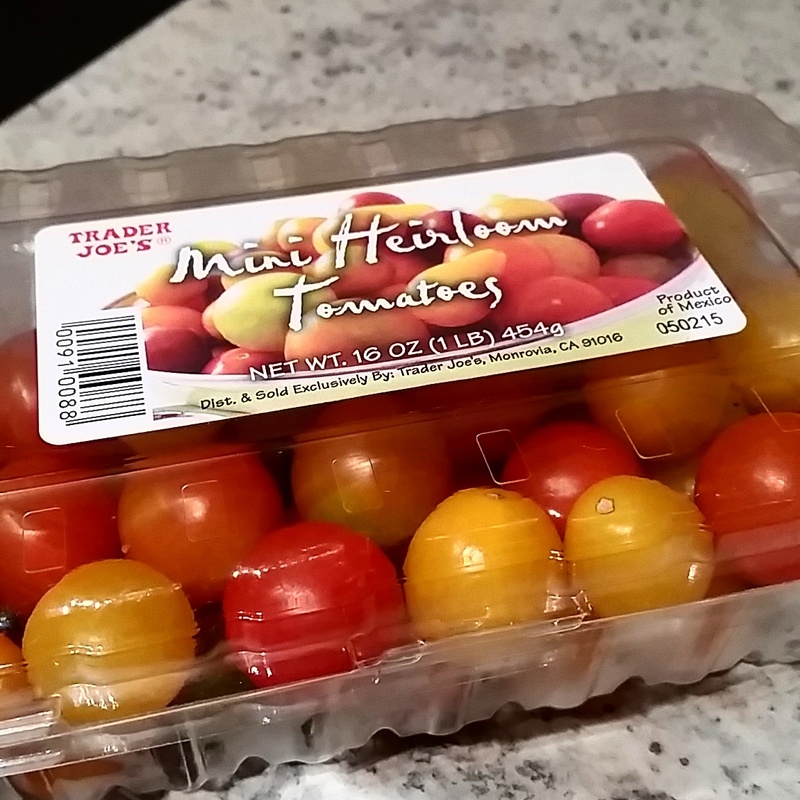 I love all of the different color tomatoes. They are the perfect mix of a little sweet and tart. 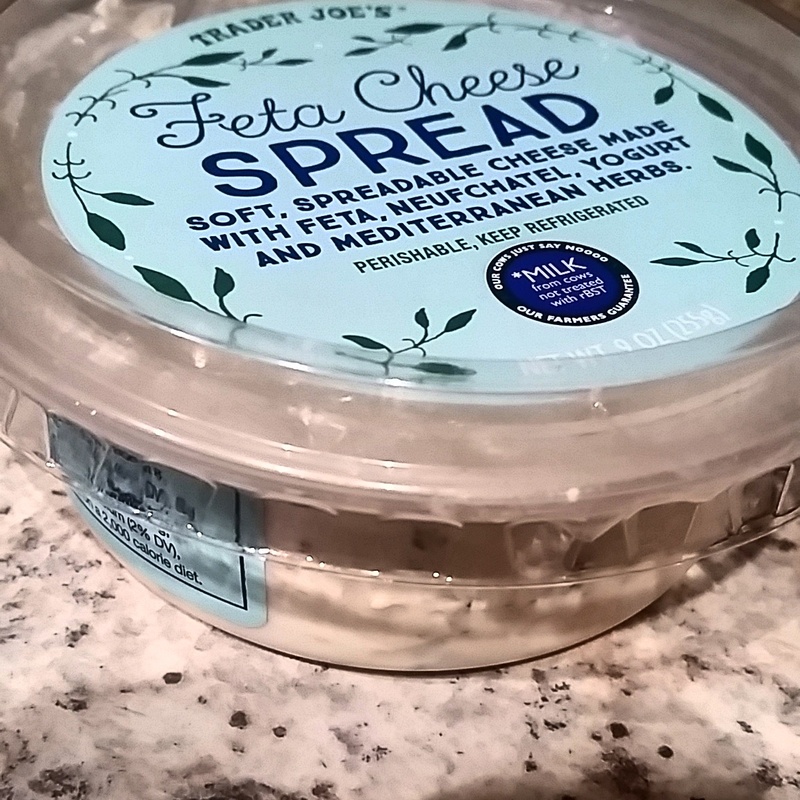 -Feta Cheese Spread. Yep, it’s just as dangerous as it sounds. Great for a party! 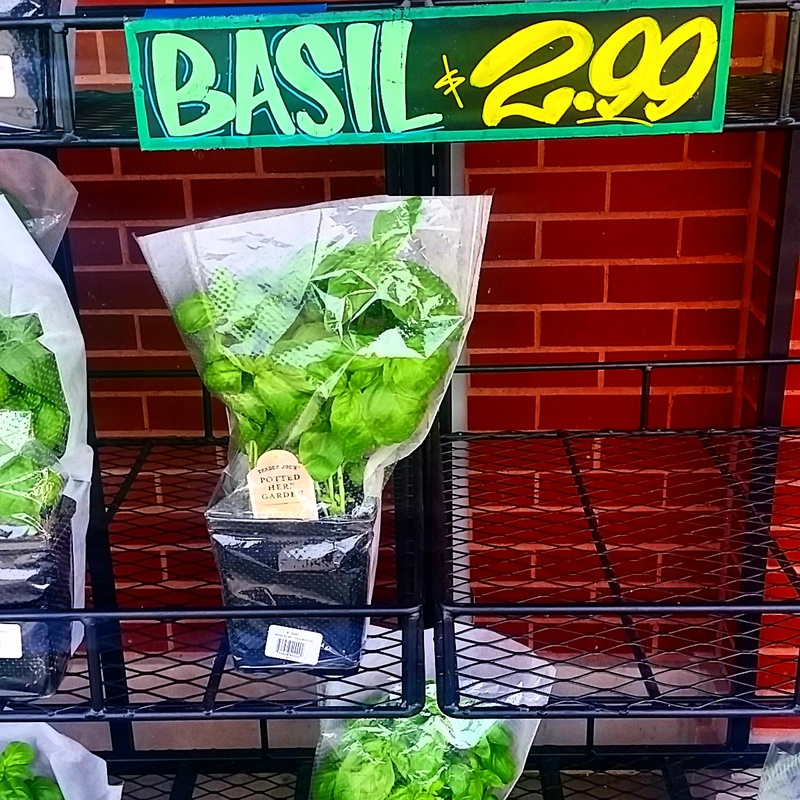 -Fresh basil. 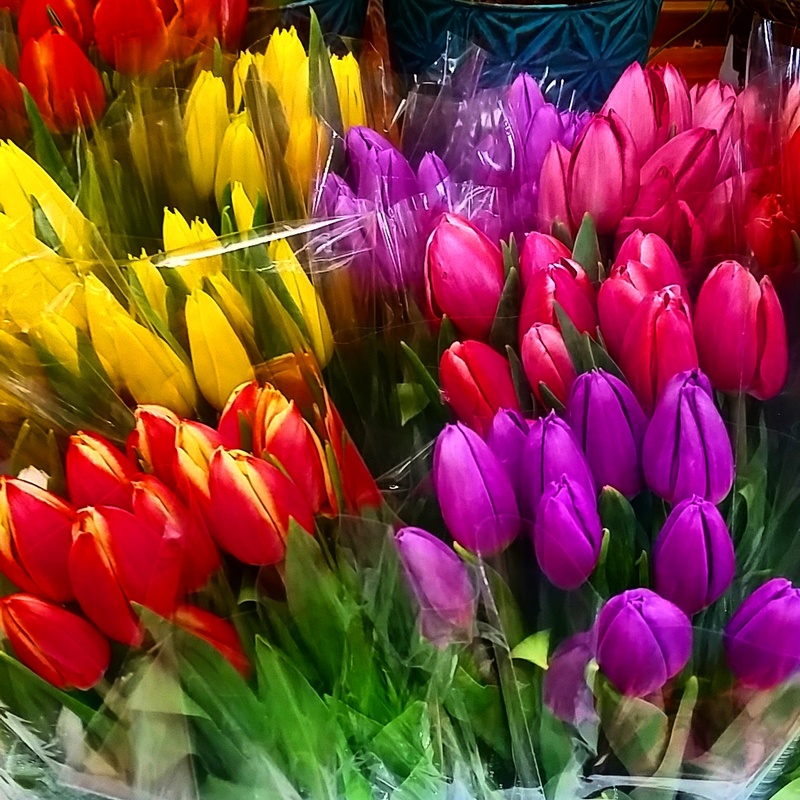 Nope…you can’t go wrong with 2.99. -Flowers! Because…why not. Treat yoself. -And…it just would not make sense if I did not bring up the 2 buck chuck. This vino is where it’s at. 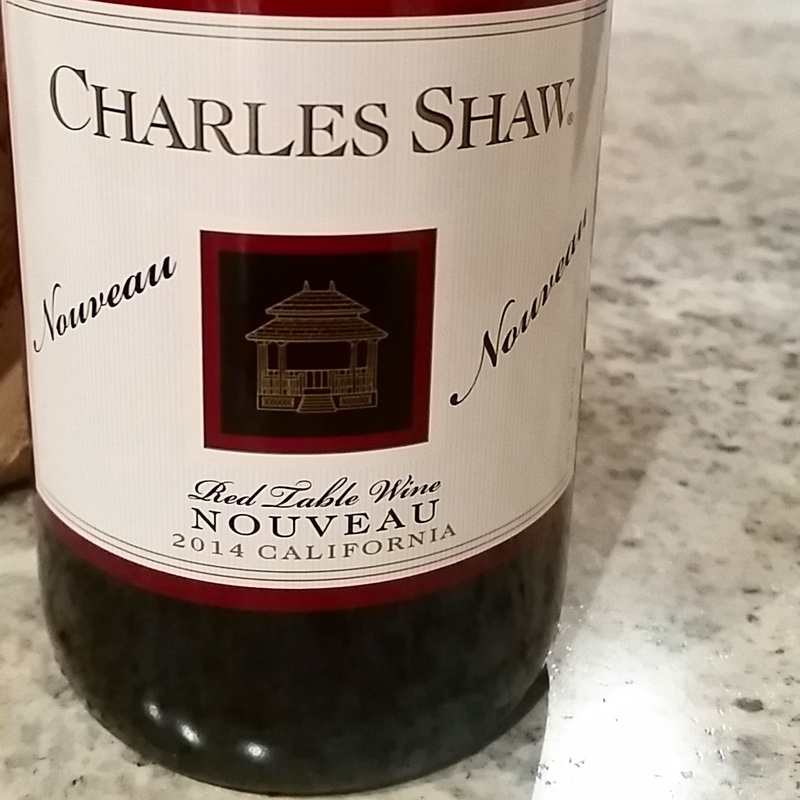 I just bought the Nouveau red wine and it’s a nice bold red with a smooth kick at the end. Love it. Do you have a Trader Joe’s nearby? Have you discovered any new finds? This entry was posted in Food, Fun, Running by thedancingrunner. Bookmark the permalink. Great job on your run. I rarely go to TJ as it’s so far out of my way. Looks like you found some great deals! Thx Michelle! TJ’s is definitely a treat! Ashley…yes you are a lucky duck my dear!! We just got one recently. Last week I discovered honey-sesame cashews (think cashes coated in honey and dipped in sesame seeds). They are like crack! I simply cannot buy them again. LOL!! Glad to hear they have TJ’s down in H.town! Powerberries are everything IF you can find them, they fly off the shelves. Great run this morning. AS USUAL!!!! i didn’t mind making the drive into town to hit up Trader Joes but we are FINALLY getting one like 5 min away from me this Summerrrrrr!!!! so excited. you picked up some good stuff! II really hope a Trader Joes opens up here soon. Such fun finds! Oh yeah I hope you guys get one up there too in Canada! You would love it!! Trader Joe’s is the closest store to my apartment and I still get in trouble every time I go in! Love that place. heehee…my thoughts exactly, Jane! Love it!! love Trader Joe’s, but i hardly go here in NYC. i really should go more, esp to the wine store! i wish there was one in my neighborhood. 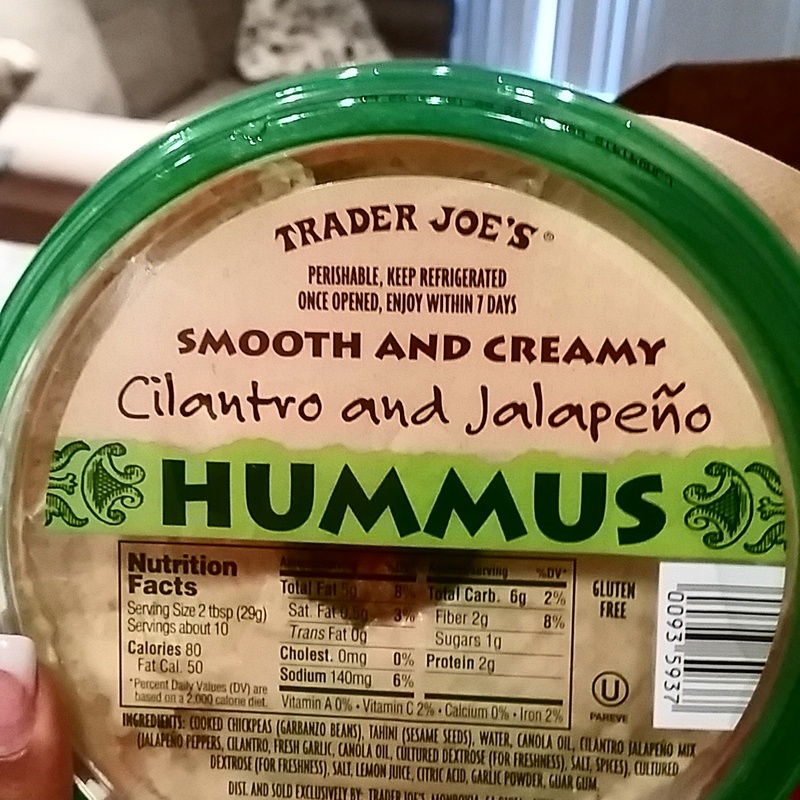 good finds — that hummus looks awesome, girl. nice job on the run! wish we could run together! Thanks boo! Yeah seriously we’d be great running pals if you lived here! That hummus sounds so yummy! We have a Trader Joes about 1 mile away from our house. i just don’t think to shop there. We are on a pretty strict budget right now, so we have to go as cheap as possible. Id love to be able to shop there though. Oh I understand! If I had kids running around and such I don’t know how much I’d shop at an all natural organic type of store. It can all get pricey and rack up quickly!